We awoke yesterday to wintery conditions and a significant amount of snow on the ground, which was enough for us to know it was going to be a snow day. 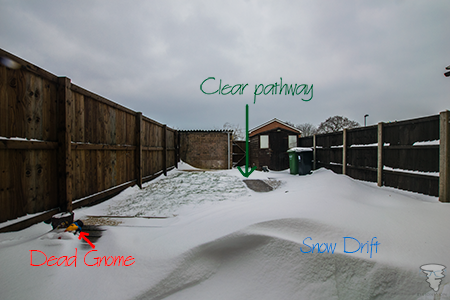 We had noticed the interesting snow drifts in our garden, which had left some areas centrally without snow and others a few feet deep. It is the first time I have seen snow drifts like this. The high winds and blizzard like conditions observed over night also seemed a bit too much for our garden gnome! drift in the corners (and on the decking) as well as wipe out out gnome! After a lazy start, a bit of breakfast and plenty of warm coffee, we dressed ourselves to battle the cold conditions and took a stroll. 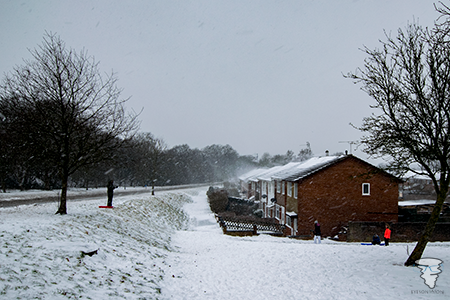 The snow was coming down lightly, but this snow was almost like tiny, hard ice-pellets - not feeling too dissimilar to small hailstones hitting you. Combining this with the strong winds, it did not make for a pleasant walking experience! The snow was actually much deeper than it first looked and occasionally walking into areas where it has drifted against a slope did cause us to go knee-deep in the stuff at times. 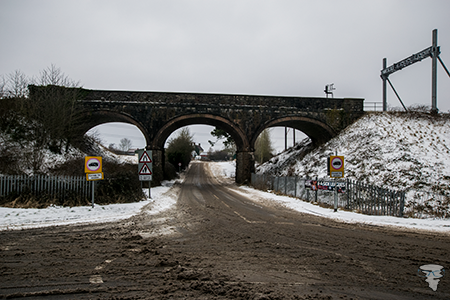 Despite how the weather felt, the snow did make for some brilliant scenery, the Westerleigh Road viaduct looked quite special in these conditions and there were plenty of photo-opportunities. As you can see, the roads were not in great shape - although this road was much better than many of side-roads and streets that we passed. 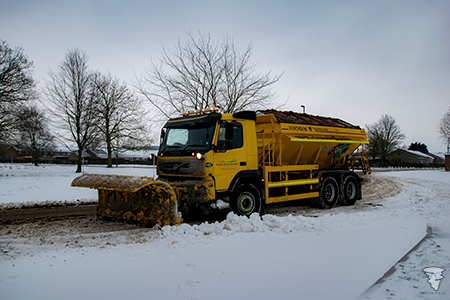 This is probably due to the presence of the snow plough, the first I've ever seen in this area. The driver kindly let me take a picture! They have done a great job in this awful weather! Our walk took us to Westerleigh Common and the "Road-to-Nowhere", a stretch of dual carriageway that was never completed. It has been used several times as the setting for road scenes in TV shows (such as the BBC hits Broadchurch and Casualty). We didn't stay out too long due to the temperature and also wanting to return home for a drink. I still had time for a few photographs though! 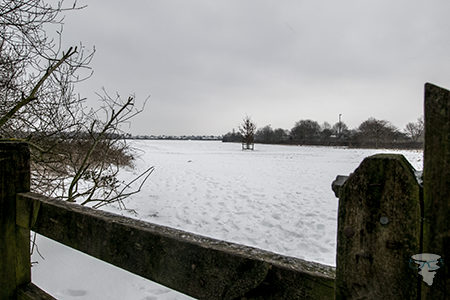 The snow around here had frozen along the top, causing slight icy conditions. THe snow did make a satisfying crunch as we walked though. There was also a large lack of snowmen and snowball fights - the snow was very powdery and my attempt to throw a snowball at Hannah resulted in a handful of snow powder being blown straight back into my face - not pleasant (although one for instant karma!) 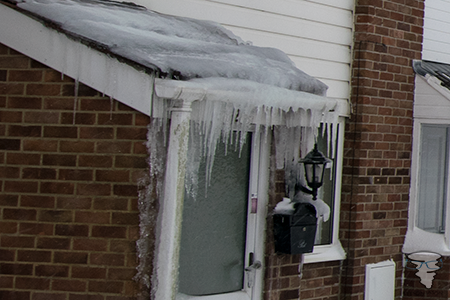 Our walk also allowed us to see some fantastic icicles on some structures - the most impressive being on the porch of this house! 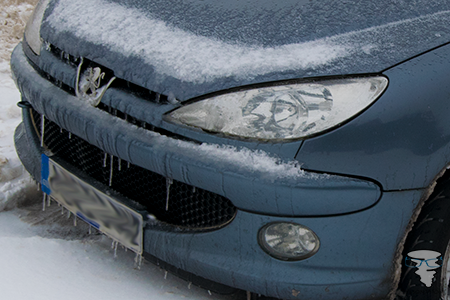 It wasn't just on houses either - there were some cars that had been abandoned that had some impressive icicles on them too! I think it would take a little more than the car heater to rid this ice in a hurry! Our return home nearly over, we decided to pop into the near by convenience store so I could pick up some beers. 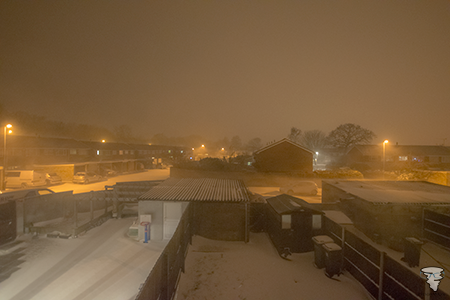 In the short time that we were in there, another snow shower came, this time much heavier than the day before. Rushing back across to our house, I managed to quickly stop off to take a few photographs before warming up with some hot drinks (Rocket-Fuel Coffee for me and a hot chocolate with marshmallows for Hannah). We didn't seem to move from the sofa then until we went to bed. We woke to snow on the ground this morning, although it is thawing very quickly. No more snow is really expected here and with the temperature a good 9°C warmer than it was Thursday and yesterday, the signs that spring is on its way are beginning to show. As much as this severe weather event has been interesting to experience, I'll be much happier when the temperatures rise further and hopefully see more of the sun!